It's 22 years since Anna Friel won her last major awards - a National TV Award and a TV Times Award for her role in defunct Channel 4 soap Brookside. Now her recent career resurgence has been crowned with another trophy - best actress at the International Emmy Awards for ITV drama Marcella. The 41-year-old was among a number of UK winners at the New York ceremony. Sir Kenneth Branagh won best actor for Wallander, while Alan Partridge's Scissored Isle was named best comedy. BBC Two's Exodus: Our Journey to Europe, which gave cameras to migrants, won best documentary. The International Emmys are awards honouring TV made outside the US. 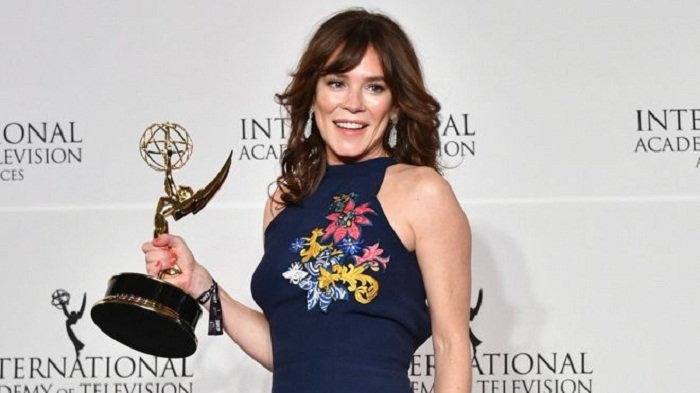 Friel triumphed for playing Marcella Backland, the former detective who returns to the police force to help solve an old serial killing case while also trying to save her marriage. Written by Sweden's Hans Rosenfeld, it was billed by ITV as "Scandinavian noir on the streets of Britain". It was shown on ITV last year and is on Netflix worldwide. Despite her performance being recognised by the global TV professionals who vote for the International Emmys, she wasn't nominated by British voters for this year's Bafta TV Awards. Filming on the second series of Marcella has just wrapped and it will be screened in early 2018. As well as Marcella, Friel recently starred alongside Sean Bean in Jimmy McGovern's hard-hitting Broken on BBC One and is due to appear on ITV again in Butterfly, as the mother of a schoolboy who identifies as a girl. Meanwhile, Sir Kenneth Branagh's International Emmy win came for another British take on Scandi noir - in the BBC's adaptation of Henning Mankell's Wallander novels. And comedian Steve Coogan picked up the comedy award for Alan Partridge's Scissored Isle, which was shown on Sky Atlantic in the UK. Monday's ceremony was due to have included a special award for Kevin Spacey, but that was withdrawn in light of the recent allegations of sexual misconduct against him.